There is a thought provoking piece at LifeHealthPro this month about how insurance companies can reach multicultural markets and ensure communities like the Hispanic community have access to tools like life insurance. According to the article, Hispanics are the most underserved population by the industry. Thirty-four percent of Hispanic families have life insurance, compared to 62 percent of the general population. The piece suggests that "one of the best ways to penetrate a market is to hire, train and educate professionals who are part of those markets." While that is good advice in theory, it can be difficult in practice. As CFS has researched and featured on this blog, state licensing requirements often screen diversity out of the financial profession. Those agents most likely to work in underserved communities are often the least likely to get a license. 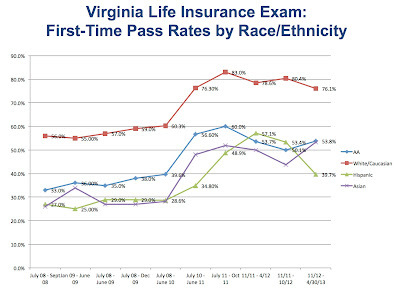 Here is recent data from Virginia detailing who gets a life insurance license on the first try in the Commonwealth. 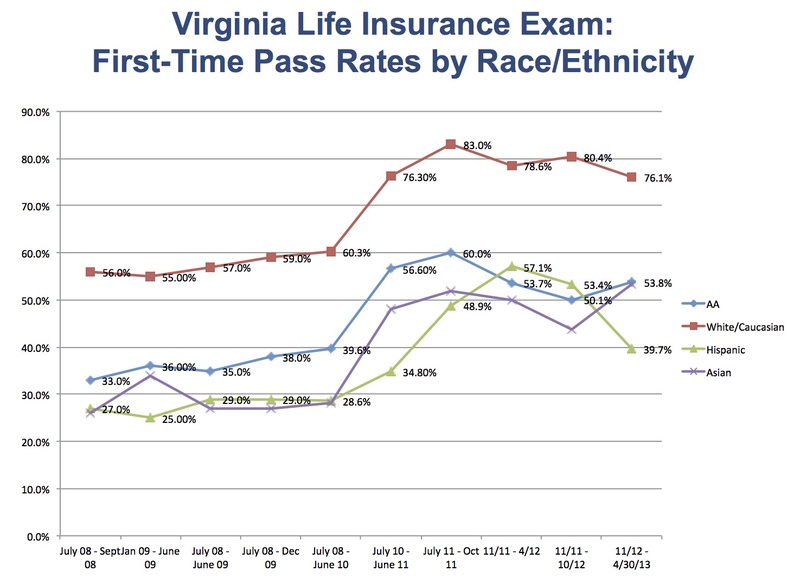 Notice that 40 percent of Hispanic candidates get a license on the first try, compared to 76 percent of Caucasian test takers. Why? What can be done to make the process more fair? Answering that question is important. If one key to better serving the Hispanic market is recruiting more Hispanic agents, then states need to do a better job of making sure the profession is open to all.